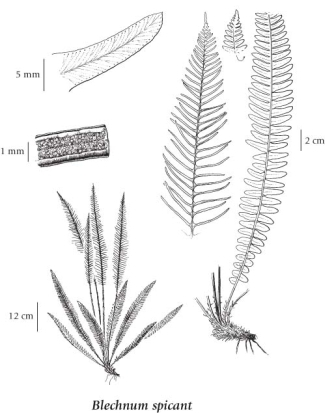 Deer fern is a perennial evergreen fern species that is circumpolar--although widely disjunct--in distribution (Douglas et al. 1998). In North America, it is found from Alaska south to Idaho and California. In British Columbia, it is abundant in coastal forests where it is found in "mesic to wet forests, peat bogs, streambanks and clearings in the lowland and montane zones" (Douglas et al. 1998). This species is widely used in coastal gardens. Deer fern has two types of fronds, vegetative and reproductive. The vegetative fronds form an attractive, evergreen rosette of broadly spreading, glossy fronds that hug the ground. Later in the season a set of finer textured, vertical, spore-bearing fronds arise from the centre of this rosette. BC is blessed with beautiful native ferns among which deer fern must surely be included. Tufted evergreen perennial from a short, thick rhizome. Dimorphic; sterile leaves evergreen, spreading, lanceolate, 10-60 cm long, 2-10 cm wide, pinnately cleft (regularly deeply lobed); fertile leaves erect, narrowly lanceolate, 20-50 cm long, 1-pinnate with linear segments up to 7 cm long, 1-2 mm wide, withering soon after shedding spores. Our plants are generally more robust than their European counterpart and are referred by some authors (Love & Love 1966, 1968) to the amphiberingian ssp. nipponicum (Kunze) Love & Love. Mesic to wet forests, peat bogs, streambanks and clearings in the lowland and montane zones; common in coastal BC, infrequent in SE BC; circumpolar, but widely disjunct, N to AK and S to ID and CA; N Africa, Eurasia. A shade-tolerant, submontane to alpine, circumpolar fem distributed more in Pacific than Cordilleran North America. Occurs in hyper­maritime to maritime subalpine boreal and summer-wet cool mesothermal climates on fresh to very moist, nitrogen-poor soils. Its occurrence decreases with increasing continentality (very frost-sensitive). Scattered to abundant (occasionally dominant) in old-growth coniferous forests on water-receiving sites; sporadic and less vigorous on water-collecting sites. Grows best on well decomposed (greasy) organic materials; on nutrient-rich soils, confined to decaying coniferous wood. Usually associated with Gaultheria shallon, Rhytidiadelphus loreus and Vaccinium alaskaense. An oxylophytic species characteristic of Mor humus forms.